What Is a Marching Band Competition? Marching bands can showcase their skills in marching band competitions. Marching bands can not only be a source of entertainment but of great pride. Many bands find that the best way to display their proficiency and bolster that pride is through a marching band competition. These competitions take place not only on local levels but also on state and national levels, and they afford marching bands of different types and sizes the opportunity to showcase their skills. Awards are generally given along with bragging rights. A marching band competition is rarely taken lightly by its participants, and many band members devote a great deal of time and effort in preparing for these events. Often considered as something of a mobile orchestra, marching bands combine musical prowess with synchronized marching skills. Although marching bands vary in size, most include a number of woodwind, percussion, and brass instruments. Getting such a variety of musicians up and moving in perfect synchronization while playing flawlessly takes time, talent, and devotion. While many marching bands enjoy pleasing the crowd at parades and sports events, most treasure the opportunity afforded by a marching band competition. It gives them a chance to really be recognized for all the hard work that goes into perfecting a marching band routine. There are several different types of marching bands, and typically most competitions include different categories depending upon the size and style of the participating bands. Still, whether the band is a show band, military ensemble, or scramble troupe, particular aspects of the band’s performance are usually judged. These include musical skill, organization, coordinated execution, and visual aesthetics. Depending upon the type of band, the artistic merit of the routine might also be judged. With regard to musical skill, a marching band can play a variety of music during a competition but must do so flawlessly. The band must also display crisp precision while playing, with their moves and routines perfectly timed so that they appear to perform as one unit. The visual appearance of the band not only refers to the aesthetic appeal of the routine in time with the music but also the overall appearance of the uniforms and matching gear. This includes the musicians, the band leader, and color guards, if relevant. Traditionally, marching band competitions took place outdoors, but as the number of competitions has grown, indoor venues have become increasingly more popular. Regardless of whether it is spring, summer, winter, or fall, a marching band competition is usually taking place somewhere. Fall is the most popular time of year for most high school and college-level competitions. Many students who participate in these competitions practice relentlessly throughout the summer in preparation. The competitions usually start at local levels and are sponsored through various schools or civic organizations. Most times, however, while starting in the local arena, the competitions proceed through various levels of increasingly difficulty, graduating on to regional, state, and national competitions. Oftentimes, there are special organizations set up to oversee and help organize marching band competitions. For instance, the U.S. Scholastic Band Association (USSBA) supervises and helps arrange high school marching band competitions throughout the United States. Typically, both the winners and runners-up of a marching band competition will be given awards of some sort. The award usually includes a trophy or plaque and sometimes can include a monetary gift as well. Most marching bands practice long and hard for these competitions and take great satisfaction in their success as they proudly display their trophies as a sign of what is indeed a well-earned accomplishment. 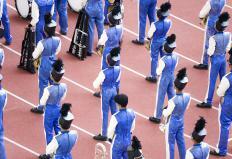 What Are the Different Types of High School Marching Bands? What Is a Winter Drumline? 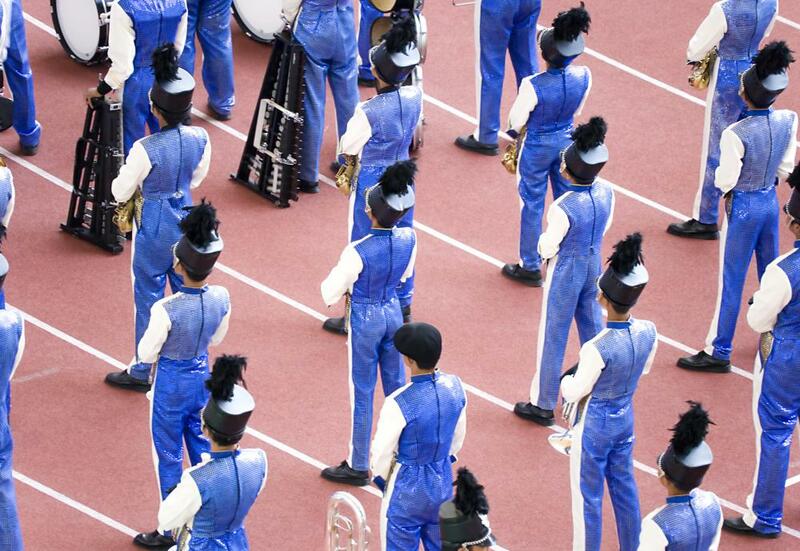 What Are the Different Types of Marching Band Shows? What Is a Fife and Drum Corps? What Is a High School Color Guard? What Are the Different Types of Marching Band Percussion? What Are the Different Types of Color Guard Competitions?